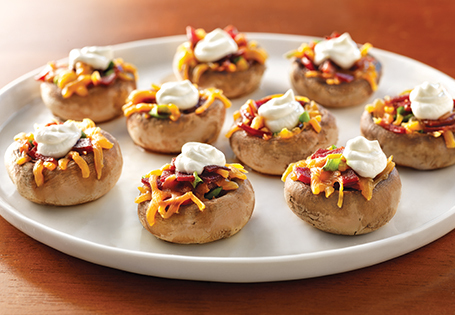 Just like potato skins but healthier! On a baking sheet, lay the bacon flat and bake for 10 minutes or until crisp. Drain on a paper towel. Crumble into small pieces and reserve. Coat a baking sheet with cooking spray. Place mushrooms on the sheet with the stem side down. Season with salt and pepper, bake for 10 minutes. Increase oven temperature to broil. Combine bacon, cheese and green onion. Place 1 teaspoon of mixture into each mushroom. Broil 3-4 minutes. Place on serving dish and top with ¼ teaspoon sour cream. Serve immediately.